Buy SurveilStar Pro with the Best Offer! Order SurveilStar Pro home edition to monitor your kids online activities, record emails, block and filter website, track browser history and protect your children online safety. 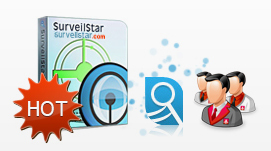 You can also check the different between SurveilStar Pro & SurveilStar Enterprise Edition. The trial version provides a 30-day trial for monitoring 5 PCs. Please check the price list below and use the right purchasing option. The trial version provides a 15-day trial for monitoring 1 PC. You can choose serial number for monitoring 1, 3 or 5 computers. License Policy: We have set up 1 license, 3 licenses and 5 licenses for ordinary household use. Parents can choose suitable license quantity in more convenient and economical way according to the number of children and computers. 1.You will receive the registration name and code immediately after you finish ordering procedures. (* If you do not receive your code after several hours, please check your spam filtering in case that our registration email gets marked as spam and sorted into a "junk" folder or deleted. Make sure emails from all addresses at surveilstar.com are white-listed. You may also send email to request that your code be resent to another email account owned by you.). 2. Our support email address is support@surveilstar.com. Feel free to contact us.